Paul and Linda McCartney. Image by I, Corwin (Creative Commons License: Attribution). “Eyes that freeze like ice, cold electric blue those diamond lights…” – who’d have thought it was 30 years ago when two Tottenham Hotspur players (Glenn Hoddle and Chris Waddle) broke into the charts? Back in 1987, the mulleted footballers hit the UK singles chart with Diamond Lights. You could safely say we reached Peak Mullet that year. Or did we? 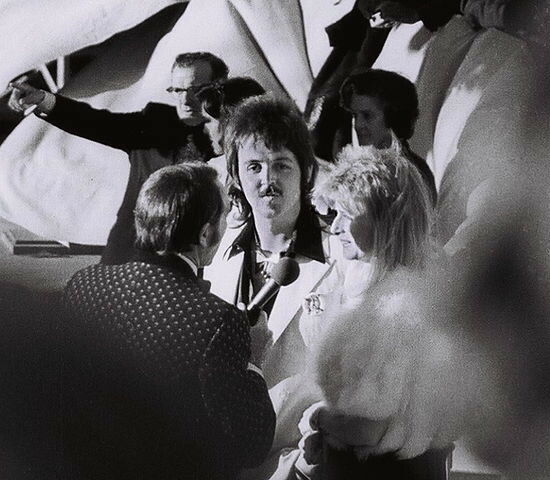 Paul McCartney’s mullet (as seen in the photo above) dates from 1974. Rod Stewart has had one from the 1970s onwards. For many of us, the quintessential 1980s version of the hairdo belonged to Pat Sharp. During the mid 1980s, Pat Sharp was noted for two positions: his role as a BBC Radio One DJ; and as presenter as Fun House. Yes, Friday afternoons after school meant an anarchic mixture of messiness, go kart racing, and a shedload of prizes. The perfect answer to being cooped up in the classroom. In the same decade, the mullet was the hairstyle of choice for footballers. As well as Glenn Hoddle and Chris Waddle, the look was copied by other footballers from the Football League First Division down to the Northern Counties East League. How could we forget Roberto Baggio in the early 1990s? Barry Venison? Rudi Voller? If you look on the Who Ate All The Pies? website, here’s some cracking examples. Musicians with mullets? Well, apart from Rod Stewart and Paul McCartney, how can we forget Limahl, the lead singer of Kajagoogoo? Also Billy Ray Cyrus. What about David Bowie’s? The late singer-songwriter looked like a 1980s Cilla Black in his. David Hasselhoff: what did KITT think about his hairdo? As for captains of industry, Tim Martin, owner of the J.D. Wetherspoon pub chain is a proud mullet wearer. Today, the mullet hairstyle is much maligned. It is seen as a relic of the 1980s like video shops and ZX Spectrum computers. Contrary to popular belief, the hairstyle dates from the 6th century, when it was worn by The Huns in Eastern Europe. Should it have stayed in the ‘80s, or is there still a future for the mullet? Feel free to comment. Passion Hair and Beauty, 26 April 2017.